The middle and high school students, coaches, teachers, parents, and other family members gathered in the gym for a presentation of awards for academics, athletics, and extracurricular activities on the morning of June 4. Graduates, Daniel Moody and Laura Kelly served as this year's Masters of Ceremonies. 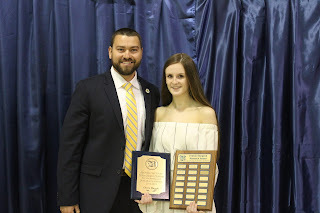 Daniel Richard (grade 12) and Olivia Buggie (grade 12) were awarded the Outstanding Male and Female in Academic and Extracurricular Activities, respectively. 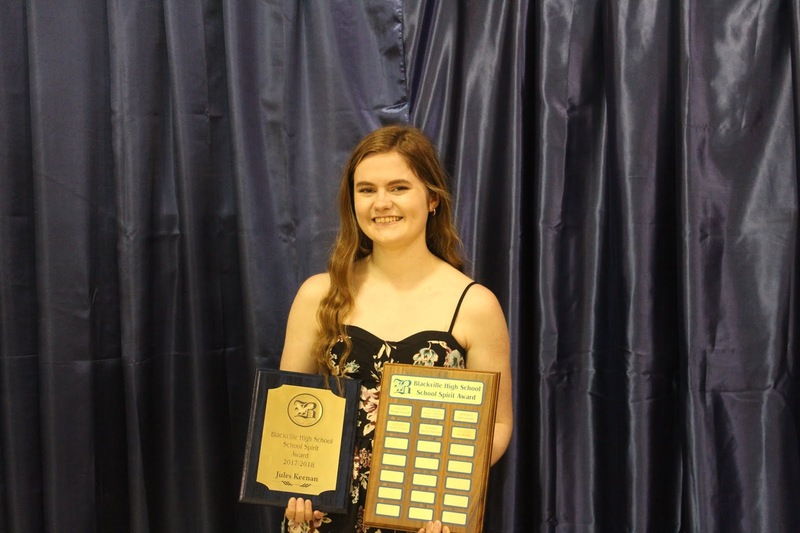 Olivia Buggie (grade 12) was awarded the Fenton Sturgeon Memorial Award. The award is presented to a grade 12 student who has been participating in sports through all four years of high school, while special consideration is given to students who have volunteered their time to coach younger athletes outside of school hours. 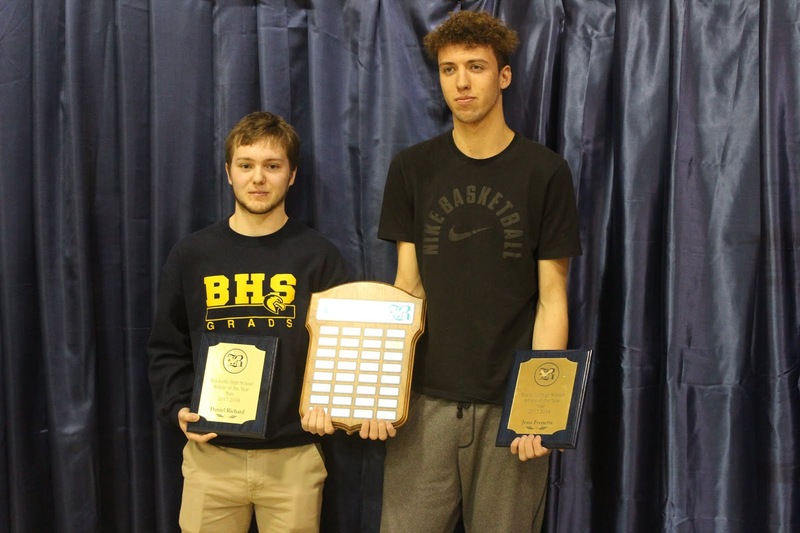 High School Female and Male Athletes of the Year were awarded to Abby Donovan and Erin Moody (grade 12) and Daniel Richard and Jesse Frenette (grade 12). 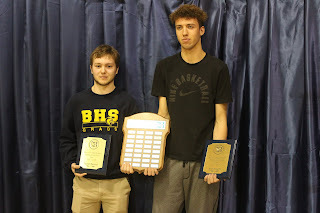 Middle School Female and Male Athlete of the Year were awarded to Kensen Brennan (grade 8) and Hudson Underhill (grade 8). Jorja Donovan (grade 8) was awarded Middle School Student of the year. Maguire Gillespie (grade 12) was also awarded the Kathy McCormack Award, which recognizes athletes who are outstanding sportsmen and school ambassadors. Jules Keenan (grade 12) was awarded the School Spirit Award, which is awarded to a student who shows an outstanding example of school spirit. Olivia Buggie, Daniel Richard, Aaron Walls, Erin Moody, Jesse Frenette, Avery Brennan, Amber Walls and Abby Donovan were awarded an athletic letter, an award given to students who have accumulated a total of twelve points during their time in high school. One point is awarded for every varsity sport the student has been a part of, with extra points being awarded for things like being captain and winning a regional or provincial title. Kyle and Lillian Donovan were awarded 'Family of the Year,' a new award given to families that the school recognizes as going above and beyond to help volunteer for school activities. For more pictures from the recognition day, click here.